Hooplah started when Nicole Virgil and her family decided to take their raised-bed organic gardening to the next level by growing as close to year-round as possible. The plan involved assembling a hoop house in the fall and taking it down in the spring. It is something they assumed was an accessory structure to gardening as is, say, a shed. But then a neighbor complained about it, and City of Elmhurst forced the Virgils to take it down in February 2017. Ms. Virgil described the sequence of events on a radio show* last fall. First, city people told the family that a hoop house simply wasn’t allowed. Then they said it was too loud, but rejected the Virgils’ offer to test with a decibel meter. 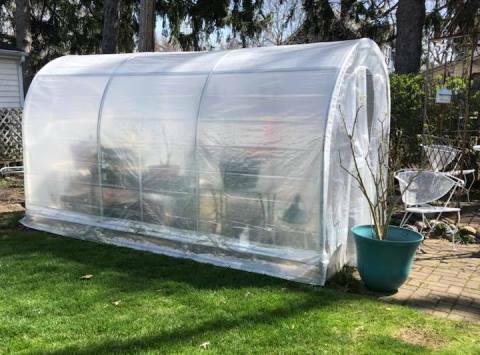 After that, the city claimed the problem was the appearance of the hoop house, but when challenged to cite chapter and verse the code violation, came up with ordinances that prohibit living or storing property in a “membrane structure” — something that’s clearly a stretch to apply in this situation. It came down to a greenhouse or nothing, “end of discussion” as they say. When Ms. Virgil next decided to canvass the neighborhood to find out which neighbor was upset with the hoop house, she ended up getting 50 signatures in support of it. Neighbors have also shown up to city meetings with as many as two dozen speaking during public comment periods. Their persistence has paid off: Elmhurst’s Development, Planning, and Zoning Committee will begin to tackle the topic on Tuesday, May 29. Meanwhile, the neighbors’ research efforts have brought other issues to light. For example, group members have spotted and documented membrane structures all over town, and discovered several probable Open Meetings Act violations. And based on aldermanic behavior toward Hooplah participants, discussion has begun about the next municipal elections. 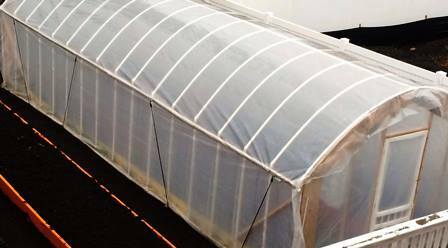 This is bigger than a hoop house. It’s been a pleasure following the Hooplah and discovering kindred spirits for good government. I wish them the best in their quest for an ordinance — and much more. Video of the May 7 Elmhurst city council meeting. Public comment begins about seven minutes in (I know!). About the crowd on the dais: Elmhurst is about the same size as DeKalb but has twice the number of aldermen. Hoop House FAQs as submitted by Dan Virgil for Tuesday’s meeting. *The radio show podcast includes DeKalb’s own Ron Cress as a guest as well. Mr. Cress has been working with the city — following a complaint by a neighbor — to amend an ordinance that classifies his native plants as weeds he must keep trimmed to a height of eight inches or less to avoid fines. Photos are property of Nicole Virgil and are published here with her permission.